Did almost 6 miles yesterday, very early out of Jack London Square. High winds were predicted by the early afternoon, so I was on the water by 7:30 AM. Wednesday and Thursday was rain, so besides some big white clouds, it was a nice, sunny day. Paddled with my coach/friend who has lots of kayak marathon racing experience. He made some helpful suggestions about my forward stroke to make it as efficient as possible. Here’s our route. I’ll be paddling in this area a lot over the next 3 months. My “official” training starts Monday with 6 miles at a moderate pace. I’ll be going out near Redwood City Mon., but Wednesday and Thursday I’ll be back in Oakland waters after work. All week is 6 miles with a 12 mile day on Sat. I’m excited to have my training schedule finally start. It’s planned out for the next 3 months; I know what days are rest and which ones are on the water , and the exact miles for each and every day. eat well, sleep well…………paddle fast! This entry was posted on May 29, 2010 by DummyDiva. 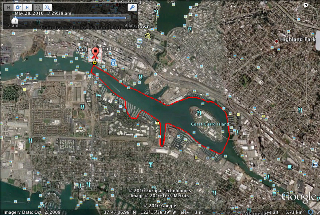 It was filed under Uncategorized and was tagged with kayaking, Oakland Estuary, outdoors, paddling, training.